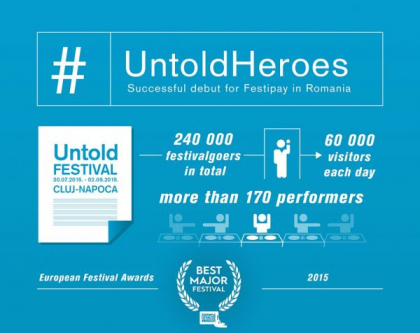 240 thousand visitors, 170 performers, and roughly 600 thousand card transactions: these figures are the best descriptors of the Untold Festival organized for the first time in 2015 and instantly designated the best grand festival in Europe. We at Festipay pride ourselves with the fact that our cashless payment solution helped about a quarter of a million Untold festival-goers enjoy the party without any inconvenience associated with cash. Therefore, summarizing our statistics and experiences, we present how we managed to successfully organize an event of this size. Organizers of the Untold Festival sought a cashless payment service provider with proven experience in other grand events. First of all, it was our success in the Sziget Festival that persuaded them we were a worthwhile choice; of course, other important factors for them were the reliability and customizability of our NFC-technology based system. Every activity related to cashless transactions was coordinated by the Festipay management team of 9 deployed. The Festipay team was in charge of the complete setup of the system, its continuous operation and supervision, as well as training local staff involved in the service. Festival organizers provided 20 people for customer service, cash management, and supervisor tasks. 100 top-up point assistants ensured smooth service to festival-goers. The festival took place on a park area of roughly 20 hectares, with the Cluj Arena as the central stage of activities. We designed our cashless payment system with the characteristics of the site and convenience of visitors in mind; therefore we proposed 52 top-up points operating flexibly with opening hours and staff size adapted to current load. At the Untold Festival, we set up a semi-online system combining reliability and real-time data transmission: practically, this meant that the internal memory of NFC cards and POS terminals stored any transaction data generated, while the system transmitted the information to the Festipay server, as well, via GPRS data transmission. Thus, we managed to operate the data network without having to set up the costly LAN network, and we ensured the continuous transmission of a large volume of data from approxametly 600 thousand transactions. Users could top up their festival cards with cash or using their bank cards; based on our statistical data, most visitors (in excess of 93%) opted for the first variant. Albeit only a small number of users took advantage of topping up their balances via bank card, we can establish that they spent twice as much on average during the festival than those who chose top-up by cash. On an experimental basis, we deployed the free Android-based Festipay application through which Untold visitors could monitor their spending, register their cards, or block them easily if lost. This convenience service was used by 6 percent of users. Any leftover balance of the festival card could be reclaimed within 48 hours after closure of the festival. 71 percent of visitors preferred to keep the actual cards issued, which is a good indicator of the fact that card design was a valuable interface, not irrelevant to brand-building, either.